Gov. 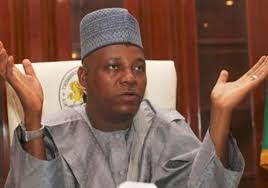 Kashim Shettima of Borno on Monday said some Non-Governmental Organisations (NGO) have been taking advantage of the pains of Internally Displaced Persons (IDPs) in the state to defraud foreign philanthropists. The information is contained in a statement issued by Malam Isa Gusau, the Special Adviser to the governor on communication, made available in Maiduguri. Gusau said that the governor made this known in a keynote address at a High Level Emergency Roundtable on the Humanitarian Crisis in Borno held in Abuja. He added that Gov. Shettima explained during the roundtable, which had the Minister of Health, Prof. Isaac Adewole in attendance, that such NGOs act under the guise of trying to help victims of the Boko Haram insurgency. He quoted the governor as saying “some NGOs are taking huge advantage of the pains of IDPs in Borno to defraud foreign philanthropists under the guise of helping victims of the Boko Haram insurgency. “The NGOs place ugly pictures of critically malnourished infants, children and adults on the social media with the impression that they are newly rescued by the armed forces from the hands of Boko Haram fighters who held them hostage for years. “Some NGOs even go in search of such victims and take their photograph to show the world, targeting unsuspecting philanthropists to part with funds for the purpose of helping the displayed victims but the fund end up in private pockets. “I need to open up here by saying that in the midst of credible organisations trying to help us in Borno, we have seen occasional instances of some `business groups’ masquerading as NGOs and smiling to the bank on the agony of our people. The governor added that “I have seen one example where someone I wouldn’t mention simply sent out horrible pictures of malnourished infants with the caption DONATE!. “I think these children, as bad as their situation might be, deserve to be respected no matter how much we want to help.